This is Mannix. He's so convincing a Link that we're told Nintendo has approached him about cosplaying the character at conventions officially. 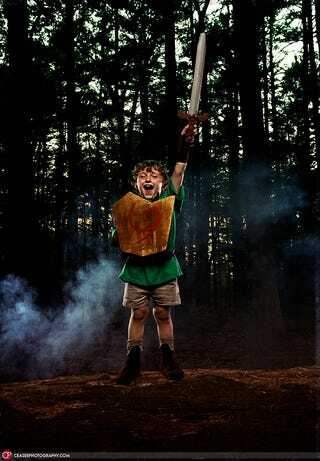 But for now we see the child in a photo shoot by the talented Sid Ceasar in some dark and forlorn wood. He's an altogether different sort of cute Link, than the one we saw earlier this morning. These photos are the work of the same guy who created a Halo-playing Muppet to propose to his girlfriend. Want To See A Muppet Play Halo? Make sure you click on the "expand" button in the bottom right of each image to see it in all of its glory. And check out the full set, all 17 photos, here.